Anyhoo, the second the cardigan was dry from blocking I was dying to wear it. So much so that I didn't even bother to finish sewing on all the buttons! I think I had sewn maybe four buttons before wearing it out to the Bitchy Bees' Bellinis Night at Milestones! I am so proud of this cardigan that I wore it three times in a week. I'm sure the ladies of my knitting group are sick and tired of seeing it already! And the colour? Sorry that you're only seeing a washed out version of it, but the blue is much deeper in real life and has way more depth to it. I'm actually really happy with how well it matches the rest of my wardrobe. For those wondering, the yarn is my beloved SweetGeorgia Yarns Tough Love Sock. 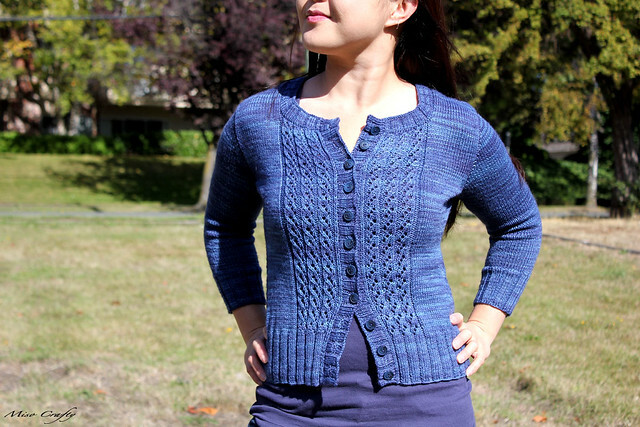 This cardigan is the third garment that I've ever knit out of this yarn and it definitely won't be my last. I'll confess that the knitting wasn't all smooth sailing. I did have some issues with the sizing of the sleeves. When I started knitting the first sleeve I thought it was going to be extremely snug. I tried it on several times and could see and feel just how tight the sleeve was. Instead of ripping out the sleeve, I had put it on waste yarn and started up the second sleeve...only this time I used the stitch count for the next size up. I went to knit night the next night and asked the girls for their opinions on the sleeves and they pointed out that the sleeves will most likely grow after blocking, not to mention over time. Cause didn't my Queen Honeybee cardigan stretch out enough in the sleeves? Ah, the ladies are so smart! And so right. I'm just glad that I didn't rip out the first sleeve and that there were two sleeves to experiment with! So I ripped out the second sleeve and finished the first. It was a little tight whenever I tried it on but sure enough, after a good soak and a (slightly aggressive) blocking, the sleeves feel and fit perfectly. Thanks for the great advice girls! Another thing that I had to re-do? The buttonhole band. I've never done 3-stitch buttonholes before, just the eyelet version but after completing four of them I have to say that they are so beyond easy. I'm seriously hooked. I'll put it on record that I absolutely love these buttonholes! They look so clean, polished, and look like actual buttonholes! Not just holes within your knitting that you can squeeze a button through, but a real buttonhole. Pure.Love. For reals. Yes, they take a smidge bit longer to do but they are so worth it! Once I finished the row of buttonholes and had knit a row on top of it I realized that I could do a better job. You couldn't see it on the right side but on the wrong side there was a tiny loop of yarn that was connected from the edge of the buttonhole and crossed a stitch and reconnected to the stitch after. Almost like an elongated purl bump. I didn't care for it. I thought it looked slightly sloppy. Needless to say the perfectionist in me came out and I just had to rip back and re-do the whole row of buttonbands. Oh yeah, this is how some people can go nuts. Something as small and insignificant as a stitch-long float can drive a person bonkers and while most people would have ignored it, I just couldn't. I never said I was sane. I didn't do any modifications to the pattern. Before casting on I went over it and everything just seemed so kosher to me that I thought I would just let the designer tell me what to do. The only thing I did differently was that I used a 2.75mm (US 2) needle to pick up the stitches for the collar and the button bands and had knit a row before switching to the 3.25mm (US 3) needle. I'm starting to sound like a broken record, but I absolutely love this pattern. It is so very well written and so very thorough. You can tell a ton of attention was put into it, and I have to say that the links to the tutorials on how to do some of the techniques were greatly appreciated. It was my first time doing the fake side seams, the 3-stitch buttonholes, and knitting an Elin Berglund pattern, and I can already tell that it won't be my last!! I highly recommend this pattern and am sooo tempted to cast on for another! That's how much I love it. The only thing holding me back from casting on a second Emelie is the fact that I have way too much in my queue that I want to knit too. Your sweater knitting is amazing! I'm so wanting to knit a sweater for myself - I just can't decide which pattern or yarn! Ugh! Decisions, Decisions -I'm so undecided! Thank you! You'll love the SweetGeorgia. It's definitely my favourite yarn, hands down.